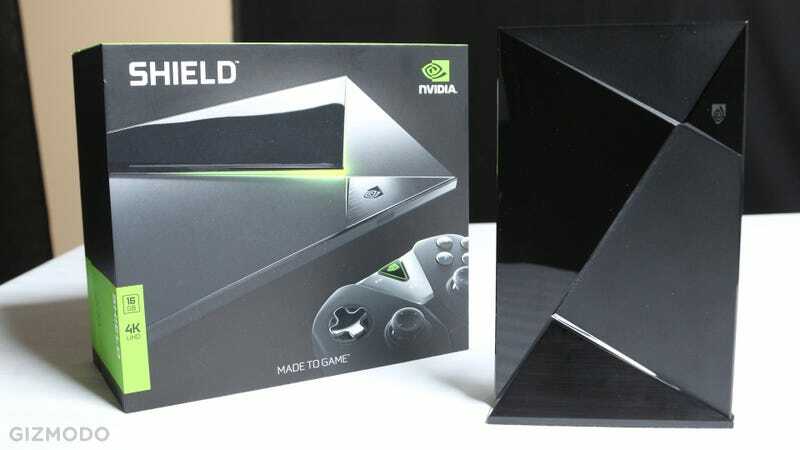 The first Nvidia Shield was a gaming handheld. The second was a powerful Android tablet. Now, Nvidia's going full game console. The new Nvidia Shield is a $200 set-top-box running Android TV, but it's more than that. It's a game console poweful enough to play a port of Crysis 3. And at first blush, it sure feels like a solid piece of kit. The first device to boast Nvidia's new Tegra X1 processor, the Shield is as angular as you'd expect from an Nvidia-built machine. It's roughly the size of a small tablet, but rakish like a stealth fighter, with corners jutting out everywhere. You know the joke about another fist beneath Chuck Norris's chin? So it is with the Nvidia Shield's angles. Around back, there are quite a few ports: two USB 3.0 sockets, Gigabit Ethernet, microUSB, HDMI out, and a microSD card slot. The console comes with 16GB of storage to start, but Nvidia tells us it'll fit a 128GB microSD card, and you'll be able to install games directly to that storage. The HDMI port can output a 4K signal. While Nvidia isn't expecting a lot of 4K games, the company says 4K Netflix and 4K Google Play Movies and TV will come to the microconsole. The console also sports 2x2 802.11ac Wi-Fi for maximum performance while streaming games—either from your GeForce-equipped PC or Nvidia's Grid game streaming service. Just like previous Shield devices. And for streaming audio from the Shield to the bundled Wi-Fi Direct game controller, which can let you keep on playing even when your significant other goes to bed. It's the same great controller that you can buy for the Shield Tablet—a solid Xbox 360 controller knockoff with great buttons and great analog sticks, plus a tiny touchpad in the center for if you ever need it. Optional extras: a nice aluminum stand that lets you prop up the Shield vertically—the console slides right in—and a TV-style remote control with a microUSB rechargeable battery and a mic for Android TV voice commands. The new Shield also has an infrared port so you can control it with universal remotes like the Logitech Harmony? So can it really run crazy-intensive games like Crysis 3? Yes it can... but it's hard to say how well quite yet. I did indeed see an early build of Crysis 3 running on the Shield, but Nvidia wouldn't hand over the controls—probably because it was stuttering a bit and clearly needed some more work. I did indeed try Doom 3 BFG Edition, and it looks pretty damn good for an Android title. Honestly, the most amazing part of Nvidia's initative isn't this hardware at all. The original Shield and Shield Tablet were pretty impressive performers for the time, too. It's that somehow, Nvidia has managed to convince big game developers like Crytek, Capcom, and Konami to finally take Android seriously. Can you imagine that soon you'll be able to buy the likes of Crysis 3, Resident Evil 5, and Metal Gear Rising: Revengeance for an Android system? And—though there was no way for me to tell in a controlled environment if it's any better now—Nvidia's Grid streaming service can fill in some of the gaps. It've been using Grid for a while now at my home with the original Shield, and as long as you've got a great internet connection it's definitely possible to play full PC games over the internet. The main problems have been that you can't port your games (and savegames) to or from Steam, so you can't pick up where you left off on PC, and that the game selection's been pretty sparse. One of those things might be about to get fixed: Nvidia's promising that big games like The Witcher 3 will arrive on Grid on launch day. Oh, and Nvidia says that when you buy games on Grid, some of them might even come with a Steam code for the same version of the game.. Starting out, it's going to be hard to justify buying a $200 set-top-box, even one with so much power under the hood, without tons of games. You could buy an Xbox 360 for that kind of money, and get loads of games and your Netflix and Hulu fixes too. But if Nvidia can bring the big console game developers to Android, give us all the new games on its GRID streaming service day-and-date with Xbox One, PS4 and PC, and figure out the Steam situtation... the Shield could finally be something special.